Russian Tea Cakes or Snowball Cookies are rich, buttery, shortbread hazelnut cookies rolled in icing sugar that simply melt in your mouth! What I love the most about Russian Tea Cakes (also known as Snowball Cookies) is that they are basically a shortbread that you can add your favorite nut to, bake up into melt-in-your-mouth buttery cookie goodness and then coat in powdered sugar. This pretty much combines everything great about cookie baking into one cookie. Now we are going to delve into the slight difference between the two cookies. 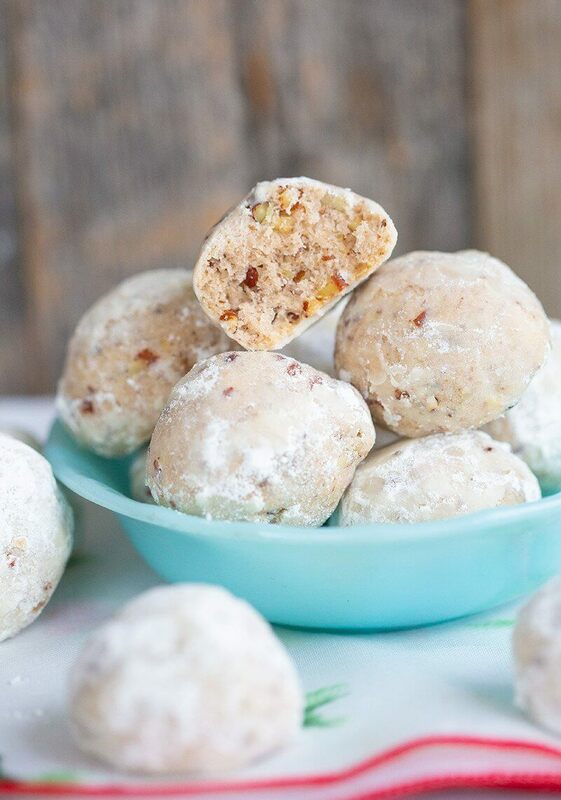 Traditionally, snowball cookies can be made with walnuts, almonds and I have even seen pecans (however when you use pecans the cookies are traditionally called pecan sandies more than they are called snowball cookies) or hazelnuts which make them a Russian Tea Cake more than a snowball cookie. 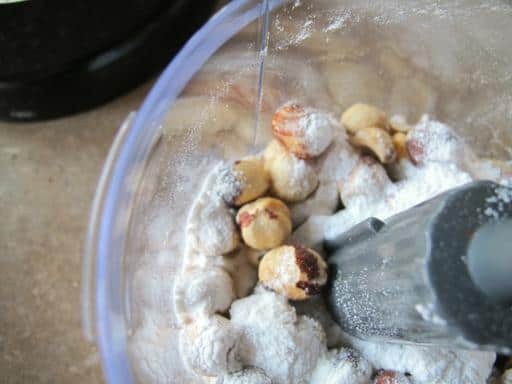 “Snowball cookies” is basically the all encompassing Christmas Cookie term for a buttery shortbread cookie with crushed nuts in it that you bake up and then roll in powdered sugar. If you are looking for traditional Russian Tea Cakes however, read on. Russian Tea Cakes are traditionally hazelnut based, although you do seen walnuts used occasionally. This actually makes a lot of sense as hazelnuts are not a huge traditional North American nut as much as they are in Europe or Eastern Europe. If you have been to those locations you will understand what I’m getting at – hazelnuts are KING. Nutella, canned hazelnut spread, hazelnut pastries, hazelnut EVERYTHING – hazelnuts are the top nut. Hazelnuts are to Eastern Europe/Russia what pecans are to the Southern United States, to give an accurate comparison. 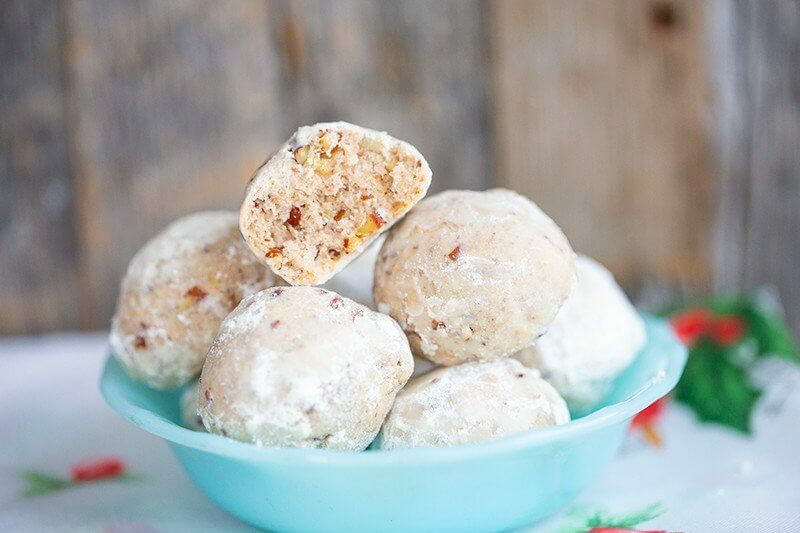 You don’t make Russian Tea Cakes with pecans – where the heck would you have been able to get pecans in Eastern Europe/Russia?? 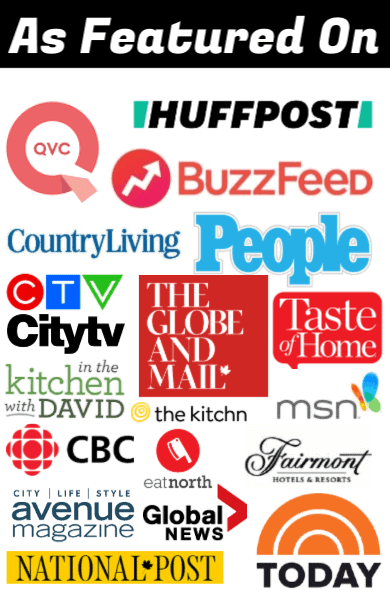 This isn’t to say that you can’t, but let’s stick to being accurate about cultural recipes when we can. Pecans are for Pecan Sandies in the South and belong to that culture as pecans grow there and are part of the terroir. Russian Tea Cakes are hazelnut or walnut based. Easy! Toasting the nuts in this recipe gives them a deeper flavour. For toasting, place the nuts on a sheet in the 350 degree oven and roast them up, for 5-7 minutes. You have to shake the sheet and roll the nuts around every 2 minutes or so, no word of a lie. You have to watch them so they don’t over cook, then the flavor is completely lost and turns into burnt nuts. 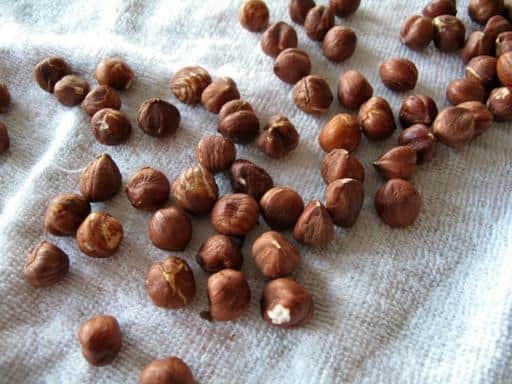 Once the nuts are toasted, place them on a clean tea towel, cover and let them sit for a few minutes. Then roll them around to get the outer coating off. You want to get them as clean as possible. Once that is done, time to get out the food processor. 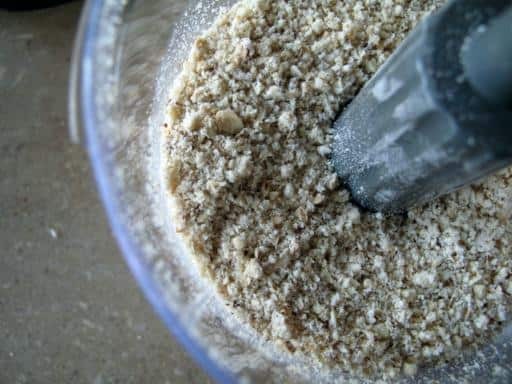 Place 1 tbsp of flour in with them – to hinder any sticking and to soak up any moisture that might aid said sticking- and process them into a fine mix. Like this, very fine tidbits of nuts. Excepting that one large one I can see in my picture below. The secret to snowballs is to use extremely hard dough, cold from the fridge. Shape them into 1 inch balls, place them on a parchment lined baking sheet and bake for 9-10 minutes, then check the bottoms to see if they are browned. You are, in essence, like shortbread, drying these out rather than cooking. There is nothing to cook, they are butter, sugar, vanilla and nuts. You do not want to over bake these. When they come out, let them rest a minute, then roll in your first layer of icing sugar. When they are all cooled and have that first layer on, roll again. The first layer melts into a lovely base coat that stays and the second is the fluffy pretty layer that looks pretty but doesn’t stay on that long. Taaadaaa! Russian Tea Cakes or Snowball Cookies. They look so plain but are so delicious! Happy baking everyone! Whether you make Snowball Cookies, Russian Tea Cakes or Pecan Sandies, all of the variations are melt-in-your-mouth amazing! Cream together the icing sugar, butter and vanilla until smooth and creamy. Add the nuts to the butter mixture and combine thoroughly. Shape the dough into a ball and refrigerate at least an hour. The secret to snowballs is to use extremely hard dough, cold from the fridge. 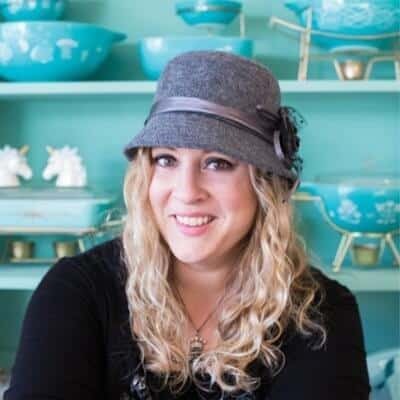 Shape them into 1 inch balls, place them on a parchment lined baking sheet and bake for 9-10 minutes, then check the bottoms to see if they are browned. You are, in essence, like shortbread, drying these out rather than cooking. There is nothing to cook, they are butter, sugar, vanilla and nuts. You do not want to overbake these. When they come out, let them rest a minute, then roll in your first layer of icing sugar. When they are cooler and have that first layer on, roll again. Place on a baking rack to cool completely, then transfer to a sealed container. These cookies freeze wonderfully and are perfect for making ahead of time for the holidays! Simply place them in a freezer safe container and freezer for up to 3 months. I call these snowball Cookie’s, make them with almond bits. They are tradition in my family at Christmas. Yummy yummy yummy! Oh, yes and Yummy! Those looks amazing Karlynn ! We know we’ll adore them as we have a similar treat in Christmas here in Greece called Kourabiedes. Those are filled with almonds. Excellent recipe and excellent photos! Hello, I just made these and they are delicious . IHello, so I made the cookies, and they are good! These are perfect, and melt in your mouth! Reminds me of my childhood, thank you! What a beautiful photo of a wonderful memory of mine growing up! My grandmother always made these and after she passed away when I was young my Mom took over. We had several different tins full of cookies at Christmas and these were always in the fancy green and gold tin. They were and still are my all time favorite Christmas cookie! Just the right amount of sweetness. I think I will make some this weekend! There’s always some baking that reminds us of grandmothers, isn’t there? Enjoy baking them and I hope you like them! Thank-you for the print link on the recipe. I made all my shortbread yesterday…does it ever taste like Christmas to me..and yes, no more sugar, it’s what makes them sooo good! Could u send some to me? To hot to turn on the oven, but not to hot to pop them in my mouth! These would be mighty tasty…. mom used to make something similar, but with pecans. I far prefer this recipe idea.